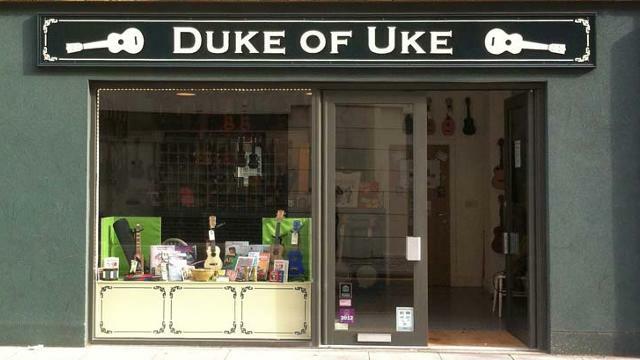 Duke of Uke is London's one and only Ukulele and Banjo Emporium. It stocks a wide range of new and vintage ukuleles in all shapes and sizes. If you're new to the ukulele and you're not sure what you should be looking for in your first uke, then the team will be more than happy to find an instrument that suits your needs. Duke of Uke also carry a selected range of banjos, guitars, acoustic bass guitars, mandolins, harmonicas and other instruments. Plus a selection of amps, FX, strings and accessories. More than a shop, Duke of Uke is a community hub offering group ukulele courses, private lessons and organizing regular gigs and events both in the shop itself and at other venues. Is Duke of Uke your business?